In the far future, Mankind has nearly exhausted all of earth’s natural resources. Fragile alliances between nations are tested to their limits as fierce wars ignite across land and space. 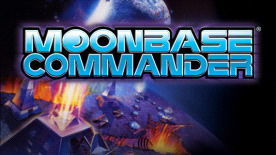 MoonBase Commander puts you in charge of your own lunar territory in a quest to build the most powerful empire in space. Find, exploit and utilize valuable energy pools to eliminate rival factions. Choose the best strategies to accomplish your goals by using weapons, surveillance or shields to fortify your defenses. MoonBase Commander is a simple to learn but difficult to master turn-based strategy game. Featuring multiple and unique opposing factions, bright graphics, a tight narrative and a variety of customizable terrains. Battle against the challenging AI or your friends via LAN multiplayer. One of the purest and most engrossing classic sci-fi games of all time. Simple rules, endless strategies. A bitter battle for territory with a perfect blend of skill and turn based strategy. Set your own challenge level in a fully customizable skirmish mode. Take on your friends on in the ultimate multiplayer LAN battle. Customize your battlefields with the built-in map editor. Note: Click "View the quick reference" link for further installation information. ©2002-2014 Rebellion. The Rebellion name and logo and the MoonBase Commander name and logo are trademarks of Rebellion and may be registered trademarks in certain countries. All rights Reserved.